This month I’m delighted to highlight an article by HBG team member Grace Chandonnet, who shares some inside information about the prospect profile. Grace works with our clients from her home office in New Orleans, a town that Mark Twain would have been very familiar with from his Life on the Mississippi. To shamelessly paraphrase Mark Twain, the report of the death of the prospect profile has been greatly exaggerated. It seems as though that during my entire 12 years as a development researcher, I’ve been hearing that the narrative prospect profile is “going away.” It’s been argued that it isn’t useful, it takes too much time to prepare and to read, that a gift officer doesn’t need all that information to cultivate and solicit their prospect. One rampant rumor was that relationship management was going to take the place of the profile. In recent years, fundraising researchers have added prospect management to their duties, and in larger shops there are positions dedicated solely to the function of prospect management. Assisting gift officers in keeping their prospect portfolios lean and vibrant is no doubt a valuable and important function. But it has not eliminated the value of or demand for the prospect profile; it’s just added more value to our work. Lately it has been said that data analytics is the thing that is going to kill the profile. Data, its collection and analysis, is a part of any forward-thinking industry at this time in history. Its value cannot be overstated. If your shop isn’t doing it, it undoubtedly is thinking about doing some sort of data analysis for planning purposes and to find new opportunities. And yet, the narrative profile lives on. When preparing for a meeting with a donor, I find that having a thoughtfully prepared research profile helps me to formulate how I’d like the conversation to go. Knowing that someone has already been a generous donor gives me confidence that I am speaking with a savvy philanthropist and I would approach him or her differently than I would a person who has not been philanthropic to date. Personally, I think it would be a mistake to ‘do away with’ the prospect narrative. It provides valuable information on many levels. There are some things that raw data just doesn’t communicate. I recall how one narrative revealed the deeply Catholic beliefs of a particular prospect. In writing a proposal, we were careful to steer clear of stem cell issues for example. In another case, the narrative recounted an observation by the researcher that a prospect was very opposed to a particular candy company’s operations abroad. The prospect was coming in for a meeting and we alerted the gift officer in charge in time for her to switch out the candy bowl which was…you guessed it, filled with the offending brand’s products. In other situations, the narrative helps the communications officer in speech writing, allowing him/her to tailor what is said to buzz-points likely to engage key prospects in the audience. Sometimes it can help set the tenor of a proposal, because it gives us a clue into the prospect’s personality, likes, preferences, dislikes, and quirks. Data analytics and relationship management are wonderful tools in the prospect development toolbox. They make our profession stronger and relevant to current trends. Like Mark Twain, we fundraising researchers are storytellers. And the smart development professional wants to hear our stories. Twain was still very much alive when his demise was rumored and likewise the narrative prospect profile is also still very much alive. 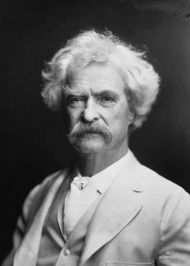 Like Twain’s stories, they just need to be well-written and speak to their audience. How do you keep your profiles alive?